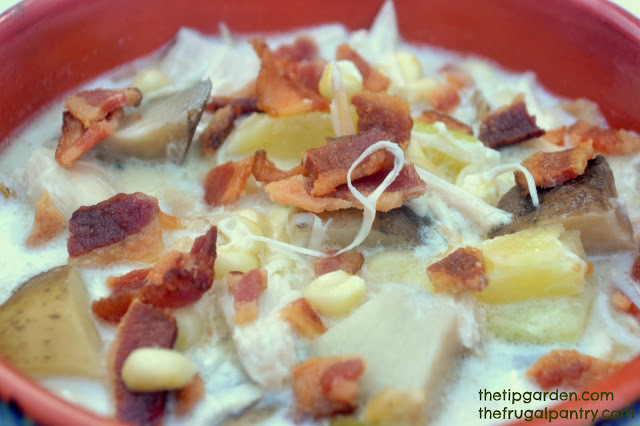 Join us for #SoupWeek!Today I am joining other blogger's in sharing some great soups like my: Rotisserie Chicken Bacon Corn Chowder! It is a wonderful soup that is not only warm on a cold night, but also a great use of leftover chicken! Add a salad or biscuits and you have a nice easy lunch or dinner. This soup starts with the ease of left over rotisserie chicken, but also has the comfort of Grandma's home cooking, since I am tweaking my husbands Grandmothers Original Corn Chowder Recipe to make this version. You get a quick, yet ultra comforting meal that is sure to satisfy! Add all ingredients into a large sauce pan and simmer on medium low 5-10 minutes till soup is heated through and potatoes (if using frozen) are cooked through to tender. Salt and Pepper to taste. If you'd like to thicken the soup: in a small bowl mix together 4 Tablespoons flour w/ 1/4 cup water. Add flour/water mixture into soup and stir until thickened. Welcome to the #SoupWeek, hosted by Palatable Pastime. This week is all about delicious and warming soups. Be sure to check out some of the recipes below or you can follow along on FaceBook, Twitter, Google+ and Instagram using the hashtag #SoupWeek. We also have a #SoupWeek Pinterest Board where you can see all of the offerings in one easy to access spot! What a great way to stay warm in cold weather!